If your object is to secure liberty, you must learn to do without authority and compulsion. If you intend to live in peace and harmony with your fellow-men, you and they should cultivate brotherhood and respect for each other. 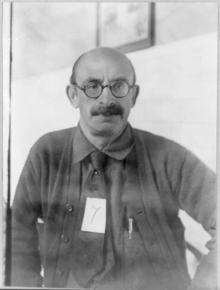 Alexander Berkman (November 21, 1870 – June 28, 1936) was a prominent Lithuan-born anarchist, and a close associate of Emma Goldman. His adult life was largely spent in the United States, Germany and France. Prison Memoirs of an Anarchist (1912), Ch. 18: "The Solitary"
Prison Memoirs of an Anarchist (1912), Ch. 18: "The Solitary". What Is Communist Anarchism? (1929), Chapter 14: "The February Revolution". What Is Anarchism? (1929), Ch. 26: "Preparation". Terrorism is tempting with its tremendous possibilities. It offers a mechanical solution, as it were, in hopeless situations. … the principles of terrorism unavoidably rebound to the fatal injury of liberty and revolution. Absolute power corrupts and defeats its partisans no less than its opponents. A people that knows not liberty becomes accustomed to dictatorship: fighting despotism and counter-revolution, terrorism itself becomes their efficient school. Once on the road of terrorism, the State necessarily becomes estranged from the people. "The Bolshevik Myth" in Anarchism : A Documentary History of Libertarian Ideas, Vol. 1 (2005) edited by Robert Graham, p. 312. ABC of Anarchism, book by Alexander Berkman.